The Comic Convention that will take place next month in New York is one of the most important get-togethers of cartoonists and comic book fanatics in the world. This year, Joanes, a Basque whaler from the 16th century, will be among the thousands of superheroes and characters drawn in ink, presenting the second part of his adventures in Terranova. Cantankerous, foul-mouthed and a drunkard, Joanes is not the kind of hero that we are used to, but his adventures among the natives of the New World will transform him (though not entirely). Guillermo Zubiaga, a Basque in the Big Apple, is the author of this Basque-American comic, a series that is only available in English published in collaboration with the Center for Basque Studies at the University of Nevada, Reno. New York, USA. 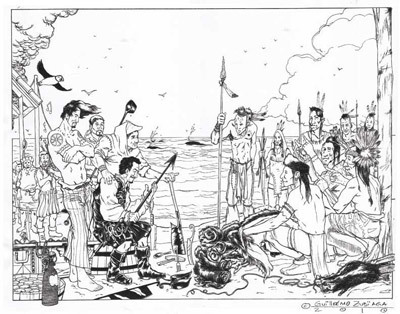 Cartoonist Guillermo Zubiaga has already finished the second chapter of his comic series “Joanes,” or the “Basque Whaler.” The latest installment will be published by the Center for Basque Studies (CBS) at the University of Nevada, Reno, and in October, Zubiaga will participate in the Comic Con in New York to present his work to comic fans in the US. “New York’s Comic Con is one of the most important pop culture events in the US and the most important one on the East Coast,” Zubiaga explains. In the second installment that will be presented in New York, Joanes’s adventures multiply. “The first chapter was a presentation of the character and in this one the narrative tension increases,” ensures Zubiaga. The author created an anti-hero: a foul-mouthed, drinker that is greedy, but as the story progresses he will be transformed. Joanes comes into contact with the natives and continues to fight characters from the first book such as the witch and other enemies. "He is a character with flaws, actual characteristics and, after all, human," said Zubiaga. "Throughout the story he will begin to act nobler, but his guile will not disappear." The first chapter is available for purchase on Zubiaga’s website as well as that of the Center for Basque Studies at the University of Nevada, Reno. Cost of the book is $5.00 and can be mailed within the US, Canada, Mexico and Europe. “I decided to take charge of the distribution of 50% of the first edition, and the other half is being handled by the CBS. “It has taken a lot of effort, but to sell copies in Argentina and in Finland, for example, has been very gratifying,” he says. The first book in the series can be purchased from Guillermo Zubiaga’s website or from the Center for Basque Studies, here.